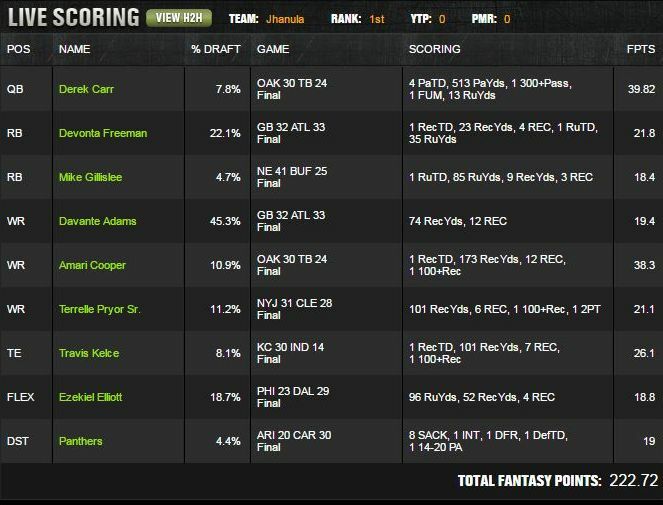 DFS Tournament Report: NFL Week 8 -- Eric Crain wins the Milly! Congratulations on the huge win! It was quite the sweat at the end there. 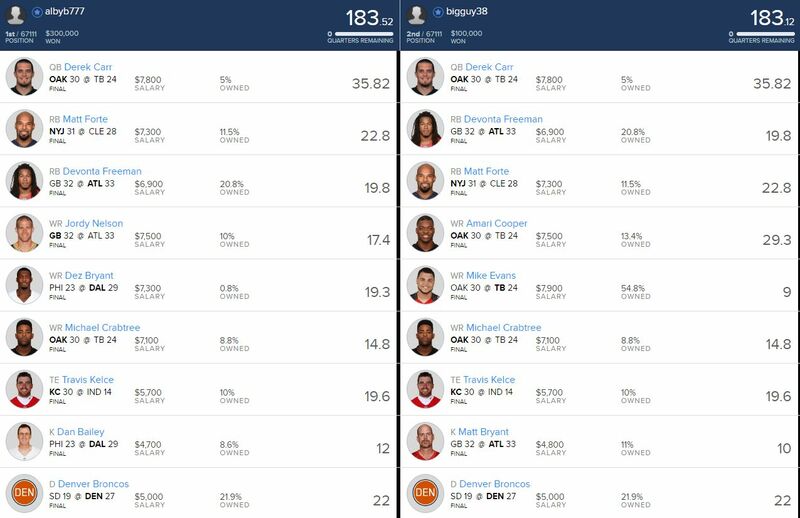 How were you feeling when it looked for sure like CongoSong and his Ezekiel Elliott lineup were sure to pass you? 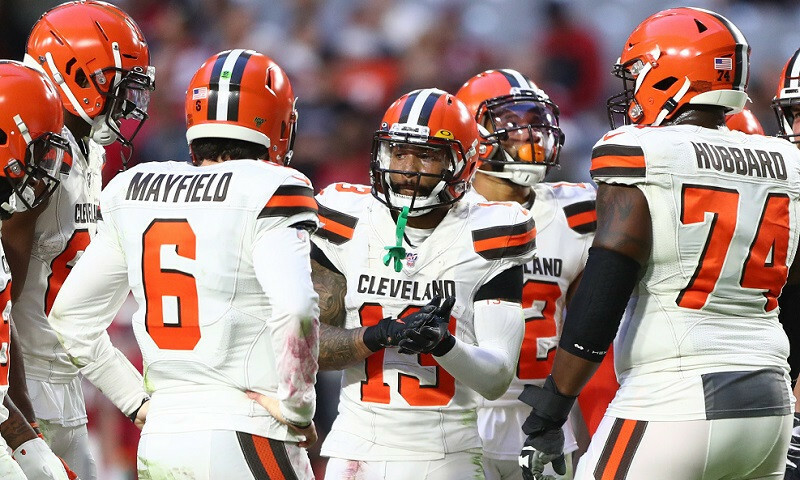 Eric Crain: I honestly thought after the first quarter I was pretty dead. Once Zeke put up nearly 10 points after one… I thought it was over. Then he never really got going against and every time he SHOULD have been involved he wasn’t. I can’t imagine being the guy who got second. Given the situations the Cowboys were in, he was a solid favorite to win I think. You were on Sunday Night Sweats with Joey Ingram and your look on your face after Jason Witten caught that game-winning touchdown was priceless. You had a “did that really just happen” look. Ingram also celebrated more than you. What were you thinking at that moment? Eric Crain: I was in pure shock. Carr to Amari Cooper was obviously a big stack for you. What did you like about them? What percent of them did you have? Eric Crain: I had a lot of interest in Amari all week, but it wasn’t until Sunday morning after my show with BigT and Hoop that I got on Carr as well. 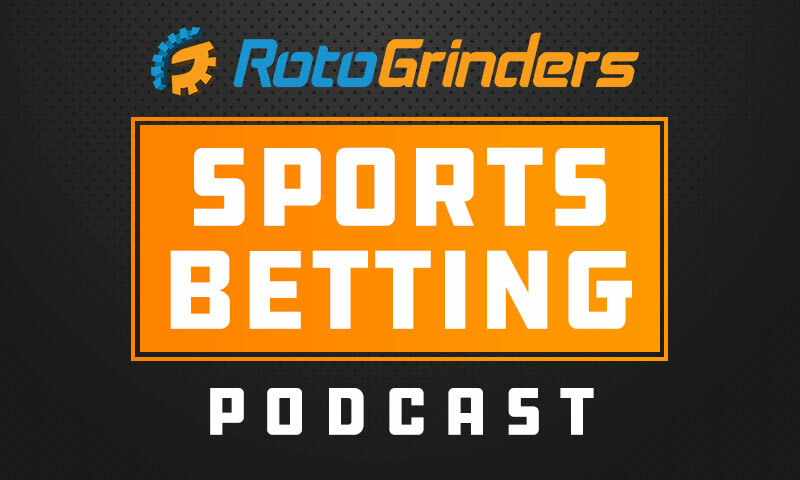 Hoop had mentioned how Amari was just a few plays from having a monster season and I decided that if I liked Cooper, I had to like Carr at $5,900 too. Initially, I wanted as much Cam as I could get, but as I built my Cam teams I didn’t like the roster construction that paying up for a QB was forcing me into. I ended up with 58 Cam teams, 49 Carr/Cooper teams, and 43 Luck/Hilton teams. The roster flexibility the Carr/Cooper combo allowed for was just too good for me to pass on. Obviously, I didn’t think Carr had 40 point upside. I was hoping he could put up a solid game and let my high-priced plays carry me to a good profit this week. Him putting up the score he did was just a bonus. Denver D and Booker were too other big plays for you. How much of them did you have? Eric Crain: I had about 30% Broncos defense. 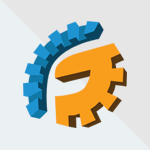 They’re the best… people never want to pay up for defenses but they’re one of the few that’s worth it week in and week out. I had Booker on 85%. I wanted to lock him in but also wanted to differentiate a bit. One last question. Other than going to Disney… any plans with the winnings? Eric Crain: ALL THE PANCAKES!!!! Haha, no plans yet. I still owe my wife a honeymoon though so that’s 100% on the list. Outside of the honeymoon though, my day-to-day life won’t really change. I like where I live and I like the car I drive. I don’t need any new trinkets or toys. As long as I have enough to stay comfortable and enjoy life as I want to enjoy it, I don’t need any new flashy purchases. I live a very simple life. 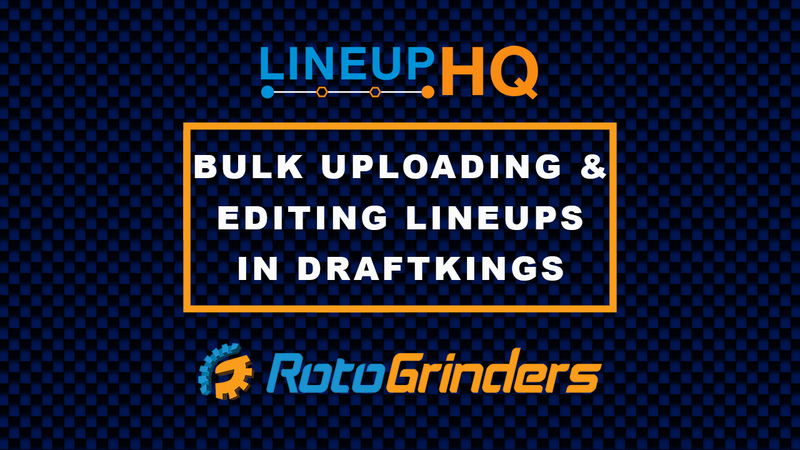 Crain, who goes by the name of jakz101 at DraftKings, would go with two super chalky players in Davante Adams (41.4% owned) and Devontae Booker (an incredible 65.5% owned – highest since Todd Gurley was 67.1% owned in Week 7 of 2015 season). Those two would actually be two of his three lowest scoring players (David Johnson being the other) but they would allow him the roster flexibility to pay up for players like Rob Gronkowski (24.9 fpts) and Amari Cooper (8.6%). 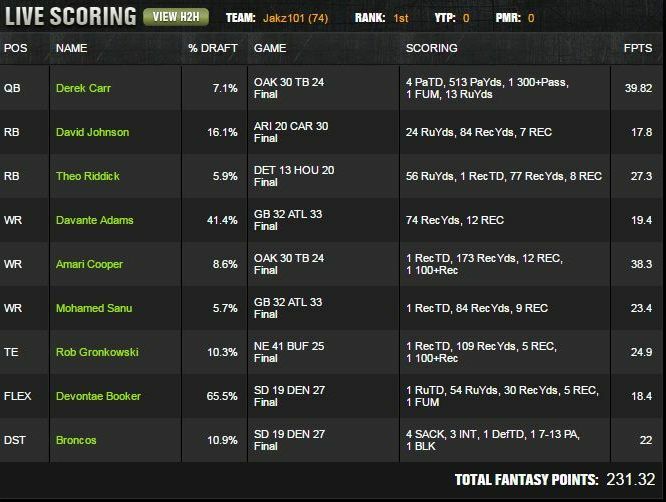 He paired Cooper with a 7.1% owned Derek Carr and added big games from Theo Riddick (27.3 fpts), Mohamed Sanu (a great pivot off the bad game of Julio Jones at 23.4 fpts), and the Broncos DST (22 fpts) to put up a massive score of 231.32. Not only did Crain win – he also took down the $1.2M Play-Action and took 3rd and 4th in the Millionaire to add to his already massive haul. 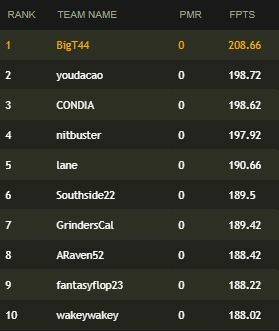 FlavorFlav would take two of the top three spots in the Wildcat Special edging out DFS legend Rotomania for the top spot. 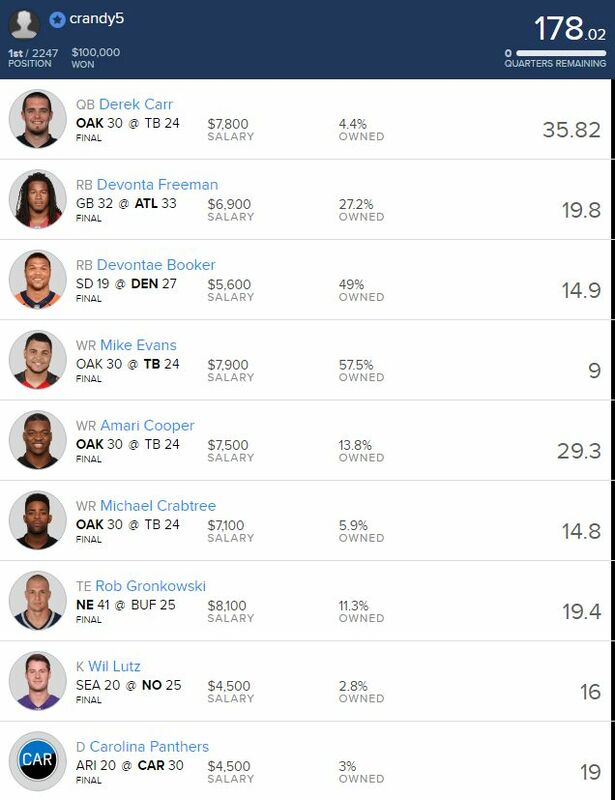 Like most winners on the day, he would have a Carr/Cooper stack and added the 21.8 fpts from Michael Crabtree to make it the ultimate Raiders stack. 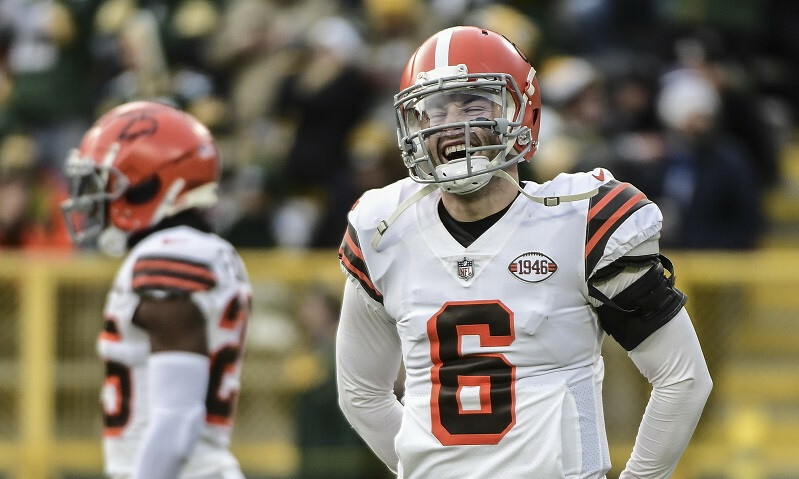 He would be able to withstand a bad game from Gary Barnidge (7.2 fpts) due to solid games from the chalky Booker and Adams as well as Ezekiel Elliott, Devonta Freeman, and the Broncos DST. 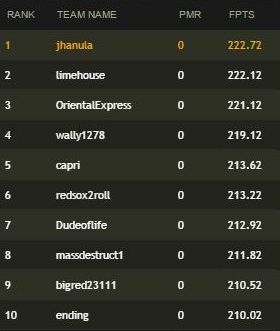 Jhanula would win by the slimmest (.6 fpts) of margins to win the Slant over timehouse. His winning lineup was actually a deviation from most winning lineups. 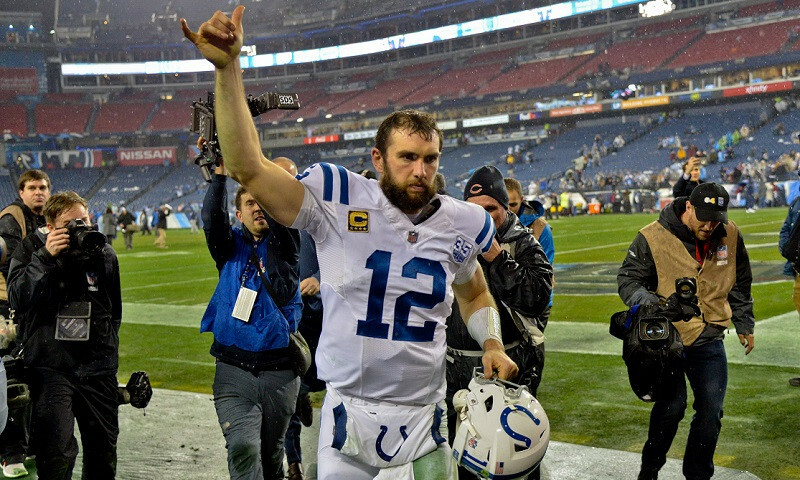 He did have the Carr/Cooper/Adams trio but varied throughout after that with the likes of Mike Gillislee (18.4 fpts), Terrelle Pryor (21.1 fpts), Travis Kelce (26.1 fpts), and the Panthers DST (19 fpts). Albyb777 entered the Sunday Night football game trailing bigguy38 by over 30 points with kicker Dan Bailey and WR Dez Bryant remaining. Things were looking bleak until Dak Prescott hit Bryant with a TD pass with three minutes left. The ensuing PAT from Bailey would move him into the top spot and he would hold on for the win and $300K prize. The aforementioned flavorflav would take 4th in this contest to add to his great Sunday. 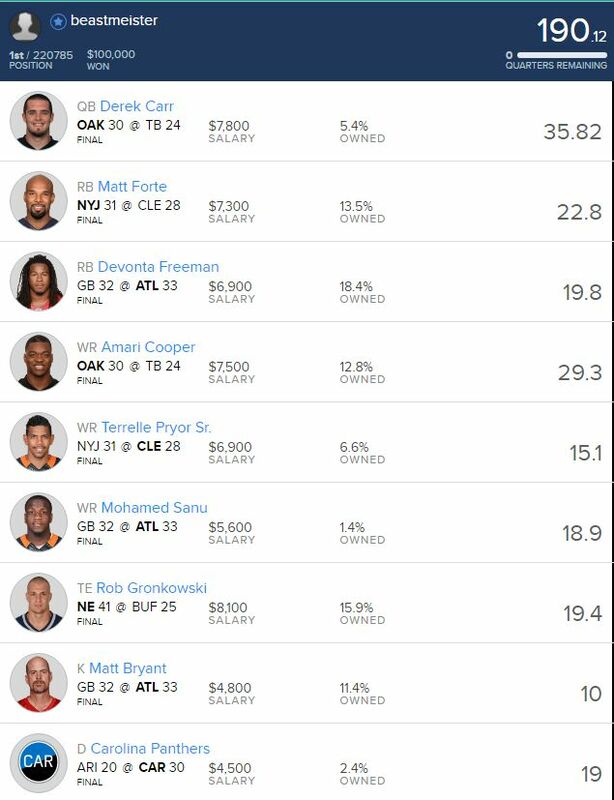 Beastmeister would use the Carr/Cooper stack (notice a trend here?) 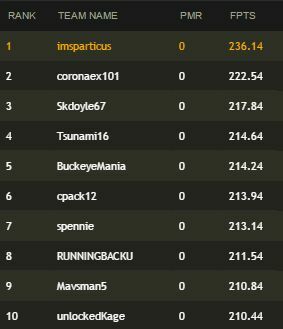 along with the two TD games from Matt Forte and Devonta Freeman to win the $100K first place prize for winning the Sling TV Rush. His lowest scoring player would be kicker Matt Bryant who had 10 points. The rest of his lineup would have 15 fpts or better including 34 from the unlikely duo of Mohamed Sanu and Terrelle Pryor. 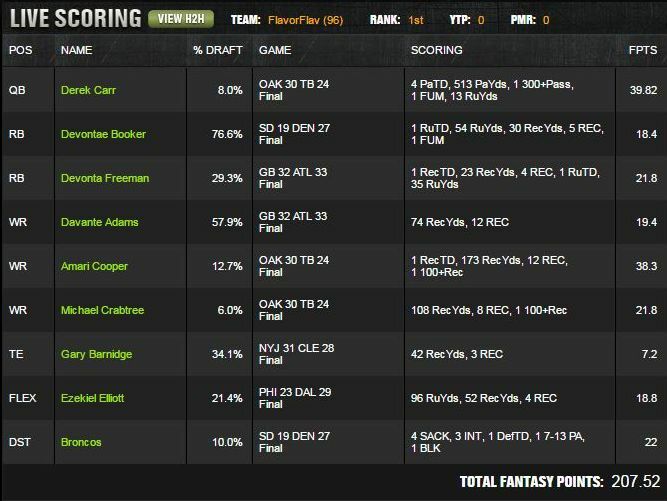 Crandy5’s winning Monster lineup had guess who in it… if you guessed Derek Carr and Amari Cooper you’d be absolutely correct. 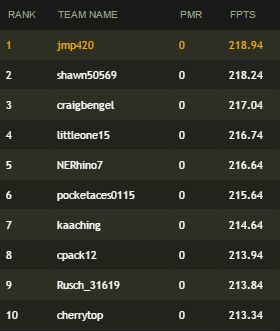 He managed to withstand a subpar 9 points from Mike Evans to edge out top DFS names like saahilsud (who took 2nd and 3rd), magicsportsguy (6th), mbomb44 (7th), and mirage8888 (10th).